The Valentine’s Day is almost here and most of you have already decided what gift you can present to your beloved one. It is amazing, but 3D industry also plays its own part in the preparation to that day and some of companies offer unique 3d printed gifts. 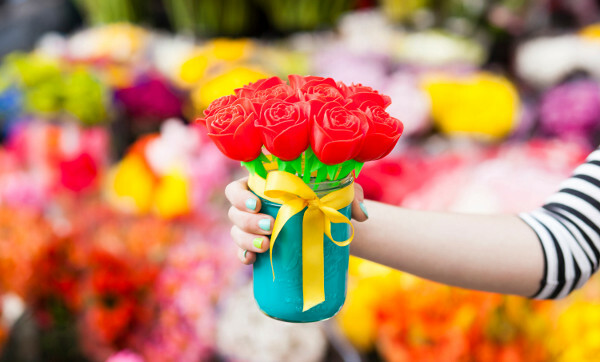 What would you say if you had a chance to buy a bunch of 3d printed roses? This is exactly that guys from Makeshop, by Brit+Co, have been offering on their website. They have proposed several options: you could order one 3d printed rose just for $15, or the half dozen roses package for $45, or the full dozen roses, that could be delivered to you for $100. Unfortunately this offer was only available in San Francisco area and the quantity that was sold also remains unknown. Makeshop hopes to offer the same roses or probably something else nationwide for Valentine’s Day 2015. Currently all offers on the website are marked as SOLD OUT that makes us to believe that 3d printed roses were a very popular and a lot of lucky ones will be surprised to get the special gift this Friday. If you are still looking for some 3d printed gifts and live outside San Francisco area, you can check variety of 3D printed gifts dedicated to Valentine’s Day on Shapeways.